Shams Solar is all about clean energy and this theme is used by various industries for the purpose of conservation. It is an eco-friendly theme and has high applicability in the renewable and biofuel electricity industries. If you are planning for a venture in the area of recycling or are already an established player in this area, this is the right website theme that you have selected and comes with some features that have a class as a result being beneficial for the energy-related companies. 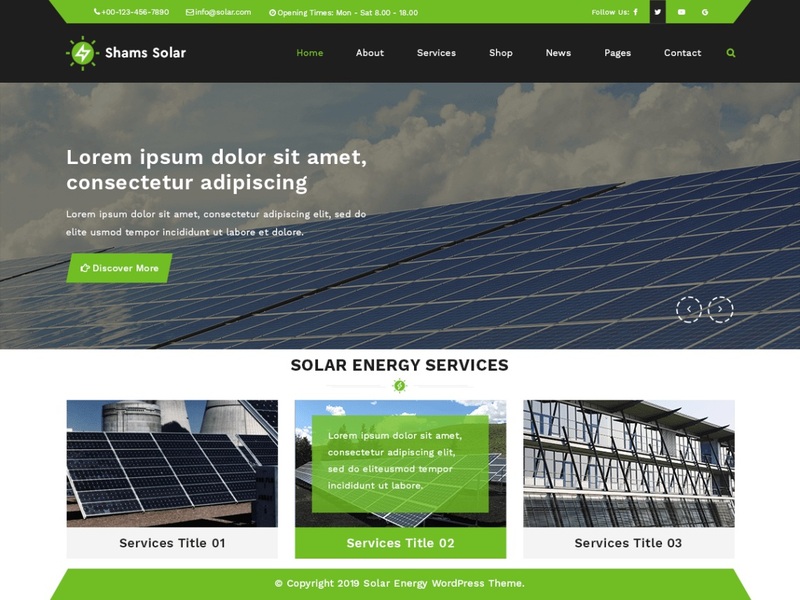 Shams solar WordPress theme is not only responsive but also has personalization options with it. It is also accompanied with a CTA [call to action button] and has numerous styling options making it quite special for the solar panel manufacturer or a firm related to the solar energy generation. It comprises of a secure and clean code apart from quick page speed and is a good buy in case you are into the wind turbine manufacturing business. In case you are dealing with the solar panel assembling services, Shams solar theme is a very good choice for you. It is also good for the organic as well as bioproduct suppliers with the prime focus on environmental cleanliness.